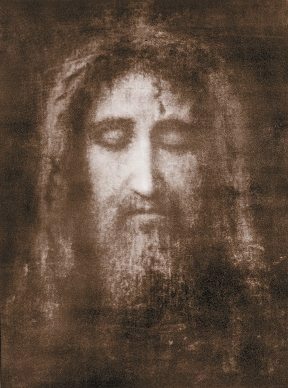 Impressions of the Shroud of Turin, the Holy Face of Our Lord Jesus Christ. “Though dead, one notices in Him a curious thing: He was only 33 years of age when He died, but to our eyes today He seems much more mature. I would easily estimate His age to be 45 years. Our Lord Jesus Christ was 33, man’s perfect age, when He died. He lived up to the full maturity of man. And here one has a notion of absolute maturity. “You will have no difficulty perceiving the extreme responsibility and self-assurance of this figure. Looking at the Holy Face one is reminded of that episode of the Gospel when the executioners about to arrest Him [asked] if He was Jesus of Nazareth. And He said, ‘It is I’, and all of them fell face down. Such was His Majesty, His self-assurance. “This answer: ‘It is I!’ recalls God’s definition of Himself to Moses when He appeared in a burning bush. Moses asked who He was. He answered, ‘I am He who is!’ If we were to say that this figure [of the Shroud] is defined thus: ‘! I am He who is’, it would be absolutely defined because it is a communication with the absolute whole, a possession of the absolute whole, a self-assurance in which one sees that He is the standard and measure of all things and that He judges all things as King and as God, in function of Himself, which is a true marvel. “At the same time we can glimpse into what His gaze might have of divinely suave and affable. We imagine what His language and the tone of His voice could possibly have of supremely affable. It is the coexistence of all virtues, all perfections, and all grades that can fit in nature, reflecting the divine nature bound to Him by the hypostatic union. “On the other hand, it is interesting to note the severity of His expression. Our Lord died the victim of an atrocious crime. The worst of all crimes, the crime of deicide, produced and operated by the greatest torment ever reported in history. This entry was posted in Catholic Perspective, Plinio Corrêa de Oliveira and tagged Holy Face, Holy Shroud of Turin, horror of sin, Jesus Christ, Jesus of Nazareth, Our Lord, victim by Plinio Corrêa de Oliveira. Bookmark the permalink.